THE US HAS offered a $1 million reward for information that could lead to the location of a son of former Al-Qaeda leader Osama bin Laden. Hamza bin Laden, sometimes dubbed the “crown prince of jihad”, is seen by the US as an emerging face of extremism and he has been the subject of speculation for years, with reports of him living in Pakistan, Afghanistan, Syria or under house arrest in Iran. “Hamza bin Laden is the son of deceased former AQ leader Osama bin Laden and is emerging as a leader in the AQ franchise,” a US State Department statement said. It said that it would offer $1 million for information leading to his location in any country. Bin Laden, who according to the United States is around 30 years old, has threatened to attack the United States to avenge the killing of his father, who was living in hiding in the Pakistani garrison town of Abbottabad, by US special forces in 2011. US intelligence agencies increasingly see the younger bin Laden as a successor to his father, especially as the Islamic State group is down to its last sliver of land in Syria. In 2015, bin Laden released an audio message urging jihadists in Syria to unite, claiming that the fight in the war-torn country paves the way to “liberating Palestine”. 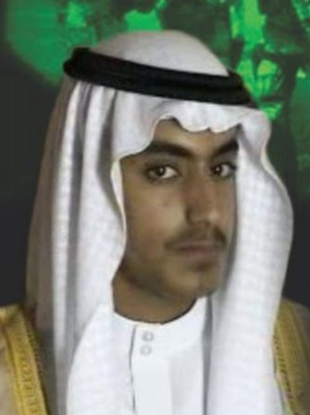 But Hamza bin Laden’s whereabouts have been a matter of dispute, and he is believed to have spent years with his mother in Iran. Observers say that the clerical regime in Tehran kept him under house arrest as a way to maintain pressure on rival Saudi Arabia as well as on Al-Qaeda, dissuading Sunni militants from attacking Iran. One of Hamza bin Laden’s half-brothers told The Guardian last year that Hamza’s whereabouts were unknown but that he may be in Afghanistan. He also said that Hamza bin Laden married the daughter of Mohammed Atta, the lead hijacker in the 11 September attacks. Email “US offers $1 million reward for information about Osama Bin Laden's son”. Feedback on “US offers $1 million reward for information about Osama Bin Laden's son”.